DXExtract is a general DX archive extractor that is generated by DXLibrary if developers choose to do so. All DX archives follow the same format, except they may have a unique 12-byte encryption key. The purpose of this program is to allow users to maintain a keystore that the program will use to automatically try each key and attempt to decrypt the archive. If a game is unsupported but you think it is a DX archive, users can try to figure out the key and update the keystore. The program runs in two modes: window-mode and command-line mode. If you right-click a file in the navigator panel, you can choose to export just that file. If you right-click a folder, you can export the folder and all files within that folder. This will unpack the contents in the same directory as the archive. Note that because of this design, you can literally copy the executable onto your desktop and drop archives over it to unpack them. im decrypting wolf file using this software, but after define the archive path why it is stopped? and indicator show “Parsing…” anyone know? If you would like to take much from this article then you have to apply these methods to your won blog. me tell you, you’ve hit the nail on the head. The issue is something too few men and women are speaking intelligently about. Is this tool still being updated, Hime? Also, I noticed the website you link to from this page for DxLibrary itself is down now. Is the one found at http://dxlib.o.oo7.jp its developer’s new site for it, or is it a fork being handled by someone else? I’ve stumbled upon an issue with certain wolf games. The DXextract’s decode works for extracting files from data.wolf. However, the devs also have the option to encrypt each file individually instead of encrypting them all into a single data.wolf. This means you have a Data folder with all sorts of encrypted files. The key for these files is always the same. So once you’ve extracted the key from 1 file, you can use it for the other ones too. Problem is, even if you add the keys to the key.ini and DXextract clearly finds the key, it is still unable to decrypt these files. I guess it is because of the way the decode function is programmed. If someone knows a link to the source code by any chance, I’m sure I could expand the functionality of the program to also be able to extract these kinds of files. does this work for the newest wolf titles now? Is anyone going to update this to Dx6, or at least provide keys that work for it? I’m trying to extract the Steam versions of Misao and Mad Father, and I’m unable to get past “Parsing” in either of them. touhouSE can extract wolf and xda(DxLib(V4/V6). I don’t know if you figured out the WolfRPG shifting encryption already, but I have a solution. Normally, when decrypting a file, you shift the key based on its current position. For WolfRPG, use the file’s size instead. So for a file of size 0x197DD, you’d use the key AAAB BBBC DDDA, since (0x197DD % 0xC) is 1. The file’s position in the archive doesn’t matter at all. I think this is a bug in WolfRPG, rather than something new to dxlib ver 6. But I’m not positive. Nike – Shoes Clearance Outlet Deals & Discounts.Find great deals and discounts on clearance shoes,Cheap Nike Shoes,all Cheap Max Air,Free Run,Jordan Sneakers Sale From China are Free shipping Best quality & returns in the US with Nike+. I’d like to replace some images in 楽園魔城リピュアリア (Magic Castle RePure Aria)(Key: 55AA2055550655AA55D57C66 ), but I have no idea how to do it. I even downloaded DXArchive, but when I try to use DxEncode or DxDecode the command prompt pops up and disappears again. Anyone here with a clue how I can put unpacked images back into the archive? Well… I found out how to encrypt and decrypt those dxa files with DxaEncode and DxaDecode now, but it doesn’t work as supposed. When I have a folder, then type in “DxaEncode.exe -K:55AA2055550655AA55D57C66 NameOfMyFolder” it does create a dxa file, but when I try to look at it with DXE that dxa archive is empty. I also tried using the key steveju posted (DxaDecode.exe -K:8P@(rO!p;s5 NameOfMyFolder), but the images still can’t be seen in DXE. What am I doing wrong :/ ? First i want to say Thank you to Steveju, love your work ! I had the same problem and i got it working somehow. I can’t be sure if it will work for you but i can tell you exactly how i did it. I’ll include all the steps, I’m pretty sure you mostly know all this stuff. I want to make it easy as possible if other people might have the same issue. In search tab type “Region” and press enter. After this search for cmd in the start menu, right click on it and select run as admin. You need to change for the drive you have the files you want to unpack, you can type the letter of your drive with this after ( : ) so for example its on the D drive i’ll type D: . Then go on the folder your files are in an copy the hole directory and paste it in Command prompt, for example : D:\Game\Test. DxaDecodeDEC 56 80 64 40 114 79 33 112 59 115 53 56 nameofmyfile.wolf . It should create a file with the same name and you should get the unpacked files. these instructions were what i needed. anyone having trouble with dxextract leading to a blank “parsing” screen, or is trying to extract from later versions of .wolf data that split the files into different encrypted files (e.g. bgm.wolf, sfx.wolf etc) should follow these instructions for each individual file as needed. also, JRE is needed for tool.jar! but you may not need to use it as the decoded string from the post above is the one you’ll likely be using. In Repure Aria and the later RimuRimu Paradise, extract using DXExtract and rename or delete the original DXA files so the game won’t find them. The game will just use the extracted data. Then you can simply modify the files in-place. For them new Wolf RPG titles. DxaDecode is found inside DX Library. All that was needed is the hex key someone provided here, then reversing the encryption and bruteforcing it back to some sort of writeable ascii since the key encryption/decryption hasn’t changed in v1.06 archives, only the way they are decrypted/read with the correct key. Thanks for sharing. I wasn't aware the author of DXLib already provided stand-alone tools for unpacking. Feels kind of silly for me to have put together this tool that doesn't even do repacking and also doesn't support new versions beyond v4. Your tool is a lot better than the one that comes with DX Lib, as yours allows us to see the file list. Another good point is that the DxaDecode/Encode tools don’t accept non-ascii characters as input like your tool does, so they’re not nearly as useful as you think. That key just happened to work with the DX Lib tools, but that’s usually not the case. You should definitely update DXExtract (see Tool\DXArchive\Source for the source code for key encryption/usage). I will update the tool to support the extraction of v5/v6 archives. The source code for packing an archive is also available, but I won’t do that part, since the packer is already available and it’s beyond the original scope of the tool, which was to simply extract assets. The non-ASCII keys sounds like a problem for those that want to use it for re-packing. I will also update the tool to display the “original” key (alongside the 12-byte key that is used, since that’s pretty much how I’ve been guessing the key) so that people can copy-paste it or something. Or of course, just put it in the key-store file. Any thoughts there? Showing the original key is fine. Deducing/guessing (or even bruteforcing) the key to the archive, if it’s not already known, sounds like a nice feature to implement too. 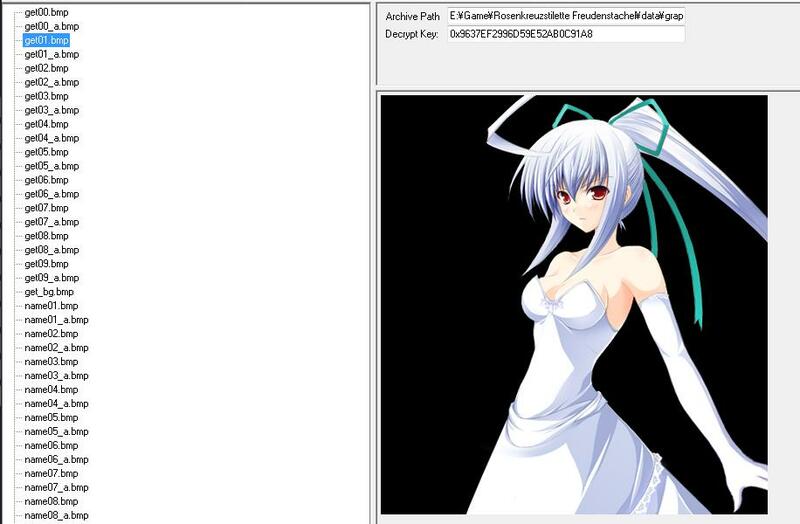 Hime, you don’t have to bother with packing when DxaEncode.exe and Wolf RPG already do it on their own. Just implement reencryption of their output with a user-supplied key since in our case (byte-wise XOR) decryption and encryption are the same anyway. And allow null key to decrypt the archive without extracting it, it’s a valid key too, technically speaking. There is no null key. It worked for Repurearia, arigatou! Hey! Could someone help me decrypting the game Numina from starlit? Please! hello it just says parsing forever game is Moekuri I want to make a mod for this game for others to enjoy. ty for your time as this was the only way I could find to accomplish this task. Thank you for the response I really appreciate it. Unfortunately it still just says parsing… at the bottom. I’ve tried to open bmp.dxa, cha.dxa, etc.dxa, basically ANY of the .dxa files. Also when I run it as a command line it doesn’t give me any input just flashes and nothing happens. I’m on Windows 10. My file creation date for these files is from December 17th so I don’t know if that would make a difference for the key. I’m also using japanese locale and running as administrator and it doesn’t matter how large or small the file is it just says Parsing… for a very long time and nothing appears to ever populate in the window. I had it working in the international version V1.00 of the game, I guess you have a newer version of the game and the dev’s are changing the key every time a new update is released, so if you find the key now, you may have to do it all over again when the next update to the game arrives. There is a way to find the key if you can read hex, use HxD or Mad Edit and know how to use ollydbg regardless of version. Attach the running process to ollydbg then go to View -> Handles, then find a open file like \Moekuri\Data\Dat.dxa or \Moekuri\Data\etc.dxa and right click to view the Hex code, if it shows viewable hex code, dump the file to your desktop as a .bin file. After dumping the file or files, open it in a program like Mad Edit or HxD and try adding the 12 byte string hex code to keys.ini saving it and repeating until you find the correct string. Remember always start from Offset 00000000. Hopefully I’ve given enough info to help you find the key, it will take a while but you will find it, I won’t be of more help as I didn’t like the game so I won’t be updating it. Good luck with your mod and I hope find the key. excuse me, the code is working but how to compress the archive back from extracted file? Same for me, would like to know how do we repack the folders into a .dxa file ? Just decrypted Touhoumon Ynk (Shard Of Dreams) and tested opening all the arc files in \dat and it worked. Very interesting, i tried in Mad Father and worked. However the new Mad Father on Steam doesn’t seen to work. Answering myself. I know now, the new version of Wolf RPG Editor uses a different decryption. Anyone know the key? This is a bit interesting. The original algorithm uses a 12-byte key for decryption. Now, If I were to apply that to the file and XOR each byte, the header comes out properly, and some files here and there look fine. However, if I re-arrange the key to this CCCC AAAA BBBB, suddenly, some other files here and there look fine, and the file entry table appears as well. At the very top (after partial decryption), it says it is DX format 6. My tool was written based on format 3, so it is apparent that some things have changed. Will need to figure out how the new format works. Wondering how it determines when to “shift” the bytes around. It may be necessary to treat it as 6 pairs of 2 bytes. And then from there, shift each one over based on some pattern. Instead of 32-bit integers, it uses 64-bit integers now. I guess to provide support for archives larger than 2 GB. The overall format has not changed; it’s just the way the data is encrypted that’s a bit weird. File table has been parsed. Just need to properly decrypt the data. Sounds complicate. Are you going to update the Tool anytime soon? This tool extracts archives that are encrypted using some algorithm that I don’t know. I have seen other extractors where the authors have reverse engineered the encryption algorithm, and will attempt to decrypt the archive automatically. My tool requires users to supply the decryption key (stored in keys.ini). The new Mad Father game may be using a different decryption key, or it may be using a different encryption algorithm, or a completely different archive format. If you can provide a sample of the archive you are having trouble with I could take a look. No guarantees though. Transition to uint64 values allows reconstruction of the key from the header (there are enough null bytes) and the last 12 bytes of the file (which are all 0 except one 0x40 byte). All files are encrypted with the same key rotated bytewise per file, and the method of rotation can be found from the exe linked above. Please update the tool to support DXv6 archives. This is the base key used to decrypt the header (first 48 bytes of DXv6 archive). All files and the table of content at the end of the archive are encrypted using variations of this base key, 12 in total (including the key itself), 1 per file and TOC. I forgot to add it to the previous message. download links are down, you should upload them to a better file host site like mega upload or media fire.